Vegan and gluten free oatmeal cookies totally packed with seeds and whole grain oats for ultra healthy, delicious breakfast cookies. 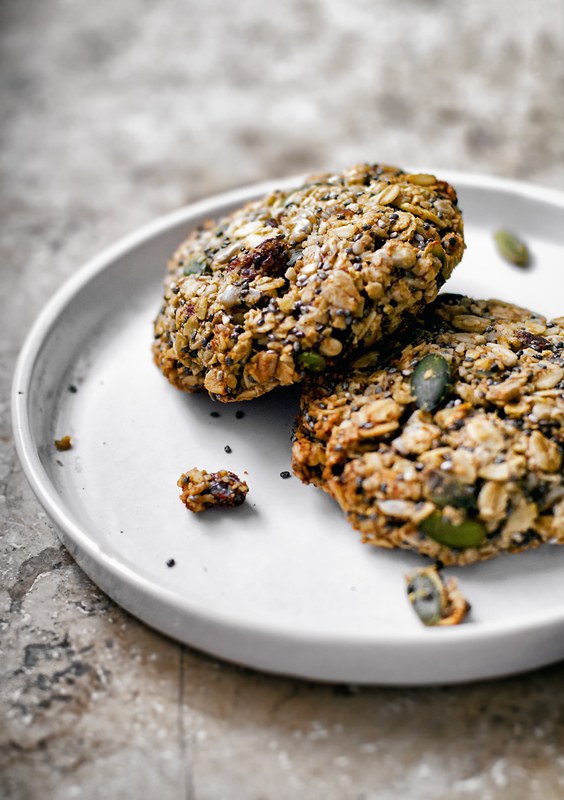 Made with a rich base of sunflower seeds, these are nut and sugar free and very high in protein. 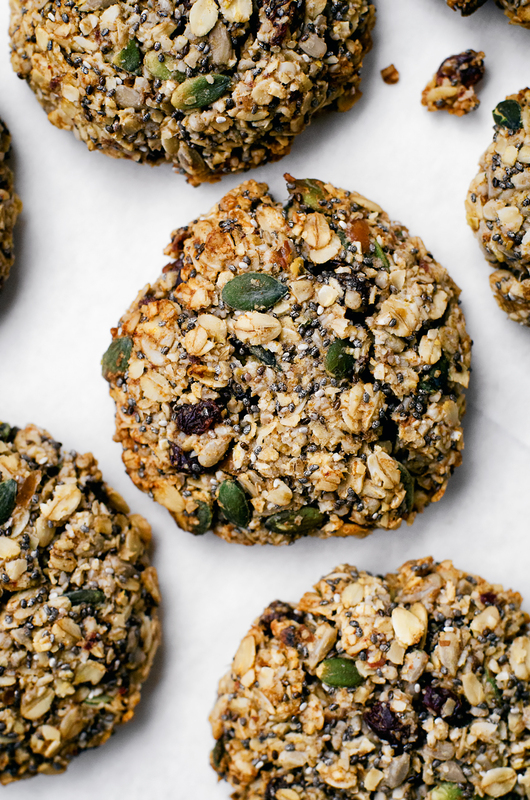 Think of these breakfast cookies as portable porridge with all the toppings. They’re made with oats (obviously), three kinds of seeds, raisins, dates, cinnamon, and some coconut oil. Not just for breakfast, I’ll have one as a snack at any time of the day, and they’re full of protein, fibre, and healthy fats – perfect energy food. It’s like a much more convenient form of granola and cookies are always more fun than bars, I think, although I’m sure you could make granola bars out of this too. They end up being huge, hearty cookies, a meal in one! Especially if you have one with a smoothie in the morning. Lots of the add-ins are interchangeable so they’re totally customizable, and I’ve included some tips on that at the end of the recipe. During the month of January I cut my sugar intake down considerably, and left any honey or coconut sugar out of my baking. I don’t use refined sugars but added sugar is still sugar, even though I try not to use much of it. I tried to sweeten everything with fruit and just have a little honey with my porridge in the morning, partly because it was a tight month financially and I just couldn’t justify buying these large quantities of coconut sugar, and partly just to see how we’d feel. I don’t think Graham noticed much of a difference but I found that my energy levels were a lot higher and steadier. It was especially noticeable around my period, when I usually have a huge slump and end up on the couch for three days. This past month I worked right through it AND didn’t have any breakouts. I’m not going to attribute one good month just to reducing the amount of sugar I ate, because it might have just been an easier month hormonally, but it seems like it helped. For a while there around Christmas time I was eating way too much coconut sugar, even adding about a tablespoon to my oatmeal, and I felt like crap. Since cutting down I’m not getting nearly as many cravings, although I think I ate my weight in chocolate snack cake last week, hah. One of the bigger issues I have with our sugar consumption is snacks; I had been making granola bars and things like that without a recipe and just throwing in some sugar or honey without thinking about it. 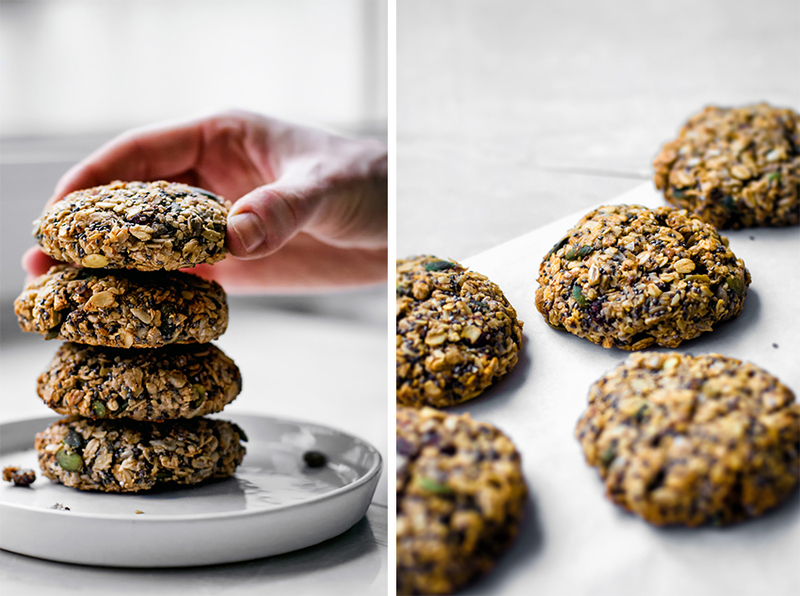 These sugar-free cookies have become my go-to now, both for a super speedy breakfast when it’s needed, and as a daytime snack when there’s only so much hummus and veggie sticks a person can eat! Preheat the oven to 180C / 350F and grease or line a large baking sheet. Place 110 grams / 1 cup of the oats and 70 grams / 1/2 cup of the sunflower seeds into the bowl of a food processor fitted with the blade attachment. Mix on high for a minute or two, until a coarse flour forms. Place the flour into a large bowl and stir in the remaining oats, sunflower seeds, raisins, chia, pepitas, cinnamon, salt, and baking soda. Blend the dates, coconut oil, and milk in the food processor until the dates have broken down and a paste forms. Add this to the oat mixture and use your hands to mix until fully combined. Form large balls with the dough, each about a heaping 1/4 cup in size. Press them with your hands to flatten to about 3cm high and place onto the prepared baking sheet. Repeat until all of the dough has been used, and then bake for 13-15 minutes or until the edges of the cookies are golden. Remove from the oven and cool for about ten minutes on the baking sheet before removing and cooling fully on a rack. They'll be a little fragile until they're completely cool. Store in a sealed container on the counter for up to three days** or freeze. • If you don't have a food processor or just don't feel like making oat flour, I've also made these with about 3/4 cup of spelt flour in place of the oat flour when I've been low on oats. They're a little more cake-like that way but still great. • In terms of substitutions, the chia has to stay, but you could switch out the sunflower and pumpkin seeds for others like flax or sesame, and the raisins can be changed with any other kind of dried fruit. Try another spice other than cinnamon (vanilla, nutmeg, cardamom, but half the amount). * The mixture will be quite stiff, really use your hands to get in there and mix until no streaks of flour are left. **I'm sure the cookies keep longer than three days, it's just that they haven't lasted longer than that in our house! These look delicious! The perfect between meal snacks! So glad they are dairy free! Thanks Heidi! I'm sure you'll love them, this recipe is right up your alley! I make a similar cookie with matcha and ripe bananas. No added sugar but still sweet and feels like a treat. Please put a print copy of the recipes. So hard to print from this page…unless I'm crazy and don't see it. Help. 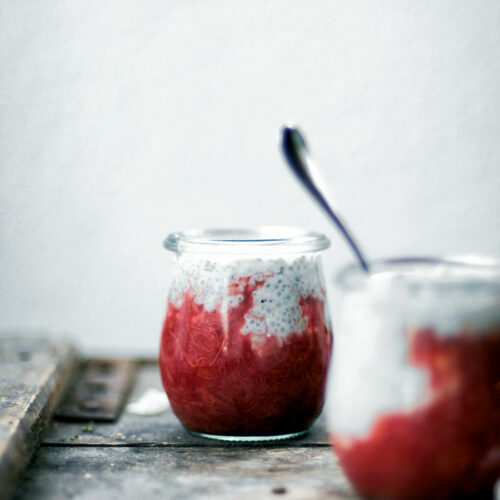 Can't wait to make! I know, Lee, I'm sorry! I'm switching site hosts within the next couple of months and I'll have a print button then – as of right now I need to code it in from scratch and I just haven't been able to. But as soon as I switch over it's the first thing on my list! As of right now all I can suggest is to copy/paste the recipe & directions, at least until I can install the print button. Thanks for your patience! Thanks, Alex! I agree, even without sugar it still tastes like a treat. these look wonderful. i don't have a food processor so thanks for the information with regards to the oat flour. But what do i do about blending in the dates? thanks so much for the help as i really want these for breakfast! Thanks Jacquie! As long as your dates are really soft you can use a fork to mash them up like you would with a banana. You can also use a regular blender or stick blender to do the date, coconut oil, and milk mixture if you have one. But good old fashioned elbow grease works too! These are AMAZING!!! I had 5 this morning. And I didn't eat more because the rest was home. I love coconut, so I replaced 1 cup of oat by 1 cup of coconut flakes. Miam. My favorite oatmeal cookies recipe so far. I love it because these are 1)Easy to adjust —— I don't have sunflower seeds at home, so I simply replaced them with almonds and they came out perfect! 2)Date-sweetened —— I always use dates in baking, I try to avoid sugar heavy foods and they are such healthy alternative. 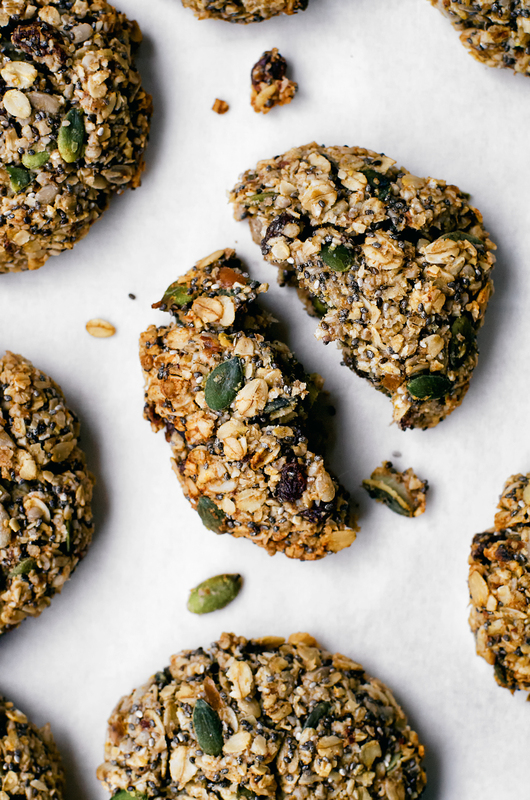 3)Perfect go-to snack —— Between meal times I like to snack on nuts, granola , seeds, and these cookies have them all but tastes 10 times better! I'm so happy to hear that, Irene! I make these at least once a week and just toss in whatever's in the house, too. Thanks for being here! Thanks so much, Christine, I hope you love them! I also made some tonight! Thought these were going to taste overly “healthy” but holy moly do they taste good!! Like one-of-the-best-cookies-i’ve-ever-made type of good. 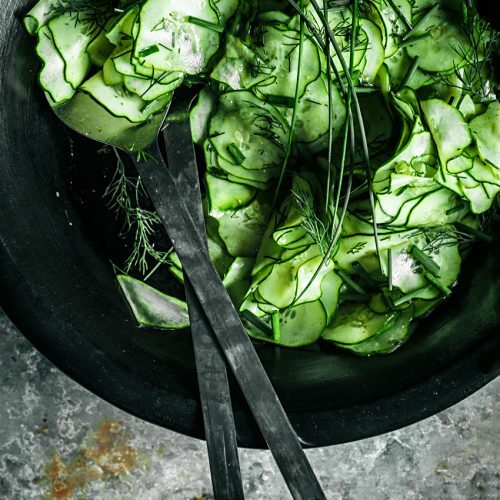 This is now my go-to recipe and I will be making these for many years to come! A note on the cookies–they don’t really rise so make sure to shape them into what you want them to come out of the oven as! Made these just now and they are so delicious! I subbed the oat flour for spelt as I didn’t have enough sunflower seeds! I’m just wondering though,they are pretty crumbly, is that normal, took a bit of effort to get them into balls! I’m not sure if for some reason I was lacking wet ingredients? Will definitely make again! Thank you! 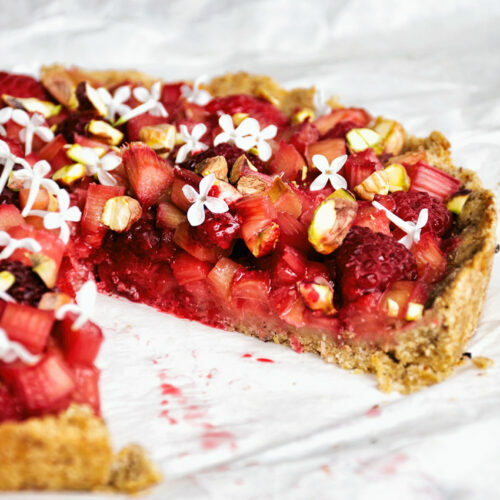 Hi Kirsty, the crumbliness you’re experiencing is likely due to your substitution of spelt for the oat flour – you need to use a little less as spelt is heavier, or use the same amount and increase the liquid by a couple tablespoons. Thanks so much for this recipe!! I have made it half a dozen times already. Switched the oil to butter once (amazing), another time tried olive oil (also excellent) and have tried substituting cows milk and even water for the liquid. Always delicious. 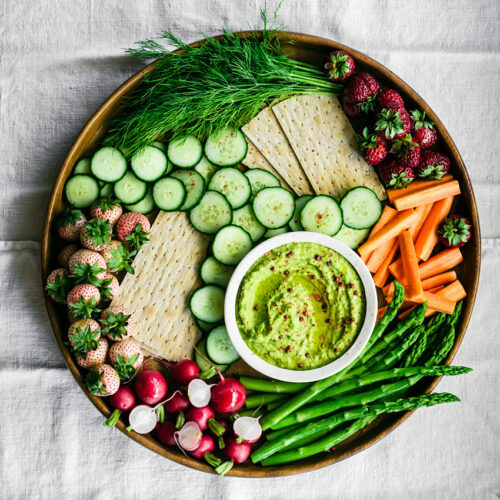 We LOVE these yummy grab and go healthy treats. You’re so welcome, I’m thrilled that you’re getting such good use from the recipe! Thanks for sharing about your substitutions, they all sound great. I cannot have ANY oil at all. Do you think applesauce would sub ok in this recipe? Hi LouAnn – I think applesauce would be fine, but I have never baked with aquafaba and can’t comment on its efficacy. I’m not 100% sure, but I’m quite certain that I’ve had messages from readers who’ve subbed out the oil for applesauce with good results.